This is part of my series on ideas for day hikes in Brittany’s southern department of the Morbihan. Please also see my earlier posts on Île-aux-Moines, Île d’Arz and Île de Houat and Île d’Hoëdic. 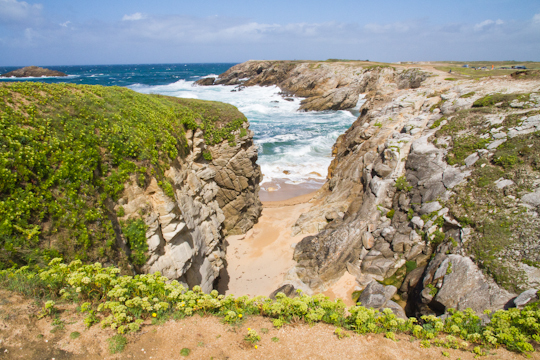 Just west of the Gulf of Morbihan, the presqu’île (peninsula) of Quiberon extends into the Bay of Biscay, attached to the mainland by a very narrow stretch of land, at times not much wider than the road. 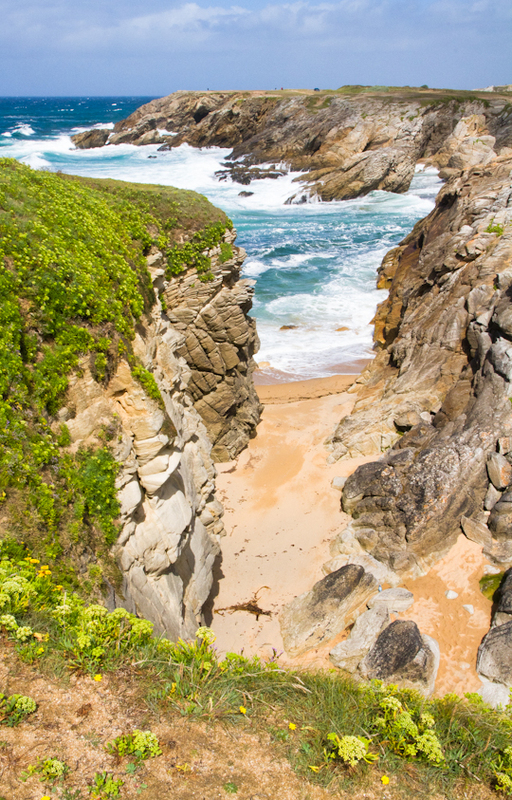 The western side of this peninsula, which faces the ocean, its violent waves and howling winds straight on, is aptly named the Côte Sauvage, or Wild Coast. The scenery is dramatic. Not much vegetation can grow in this windy climate. Tall and jagged cliffs drop down to the ocean and waves crash loudly against the rock, shooting up spray and ocean foam so forcefully that it often reaches the path far above. It is no wonder that artists such as Matisse and Monet were inspired by this landscape. 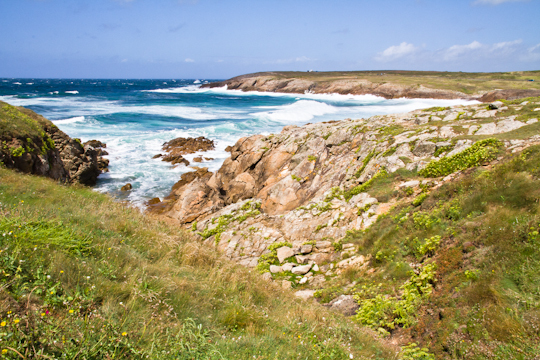 The coastal trail is part of the GR 34 (Grande Randonnée) long distance footpath that follows the entire coastline of Brittany. The trail is therefore well marked with red and white markers. For a longer hike, you could do a circuit whereby you follow the coastal path in one direction and wind your way through the streets of the Quiberon peninsula to make your way back. Driving from Carnac, follow signs for Quiberon, and soon after arriving at the start of the peninsula, you will see signs for the “Côte Sauvage”. There are plenty of places to park for free. Head south (left when facing the water) until you cannot take the wind anymore, then turn around. If you make it all the way to the town of Quiberon at the tip of the peninsula, you will see that unfortunately it is fairly built up. Nonetheless, there are a number of places to stop for food or a drink (or for a niniche, one of Quiberon’s famous caramel and salted butter lollypops). If you hike north, you will eventually come to the much quainter port of Portivy, which also has a couple of eating options. 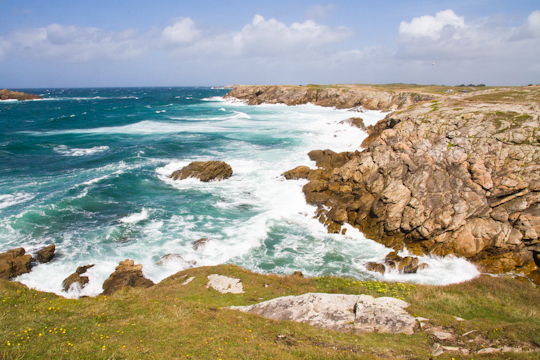 To give you a sense of distance, it is about 12 kilometers on the coastal path between Quiberon and Portivy. If you do not have a car, in the summer months you can take the “Tire-Bouchon” (corkscrew) tourist train from Auray (which has a TGV station) to Quiberon, and then hike north up the western coast of the peninsula and back. For a longer hike (2-3 days) on the GR 34 that does not require a car, see my post on hiking from Auray to Vannes. Note that this hike from Auray to Vannes could be combined with a visit to Île-aux-Moines or another island for which the ferry leaves from Port Blanc or Vannes.